Measuring Success is excited to offer three upcoming webinars to address specific enrollment challenges at independent schools. We will be hosting one session for admissions/enrollment professionals (with Ellie Levine), one for heads of school and business officers (with Dr. Harry Bloom) and one with guest presenter Ryan Wood of Immanuel Schools, a session for faith-based schools (also with Dr. Bloom). 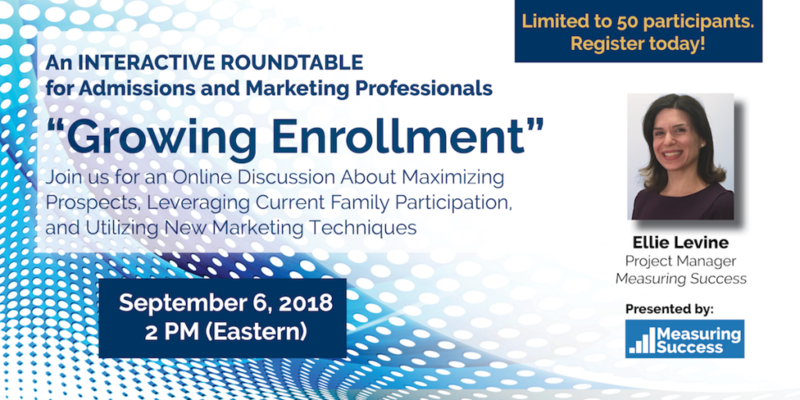 Admissions/enrollment and marketing/communications professionals are invited to participate in an interactive (online) roundtable to connect and share tips and trends on what works and what doesn’t. We will start the conversation by discussing some of the things we’ve learned in our work using data-driven prospecting, surveys, focus groups, and marketing. Then you’ll have an opportunity to hear from other professionals in your field through networking and getting group feedback. 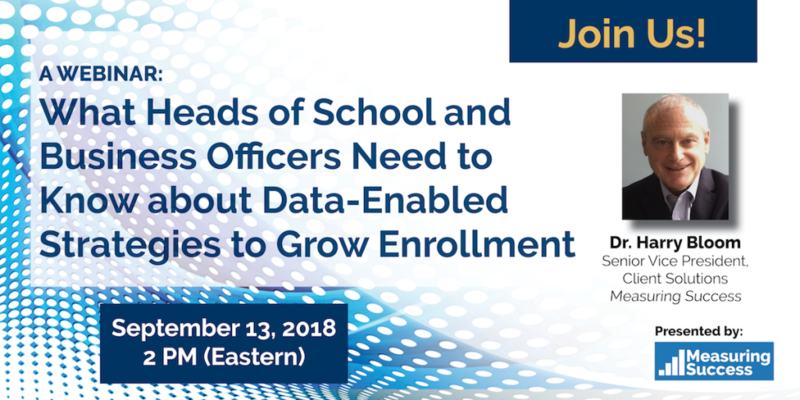 Heads of school/principals and CFOs/business officers are invited to a webinar to learn key trends in data-enabled enrollment growth strategies. Join Dr. Harry Bloom of Measuring Success to learn what you need to know. Topics include learning how to identify top-tier prospects that look like your current families, determining key value proposition elements; improving return on investment by marketing your unique strengths; and creating active partnerships among staff to systematically increase enrollment. The challenge of recruiting the best mission-compatible prospective families is always underway. 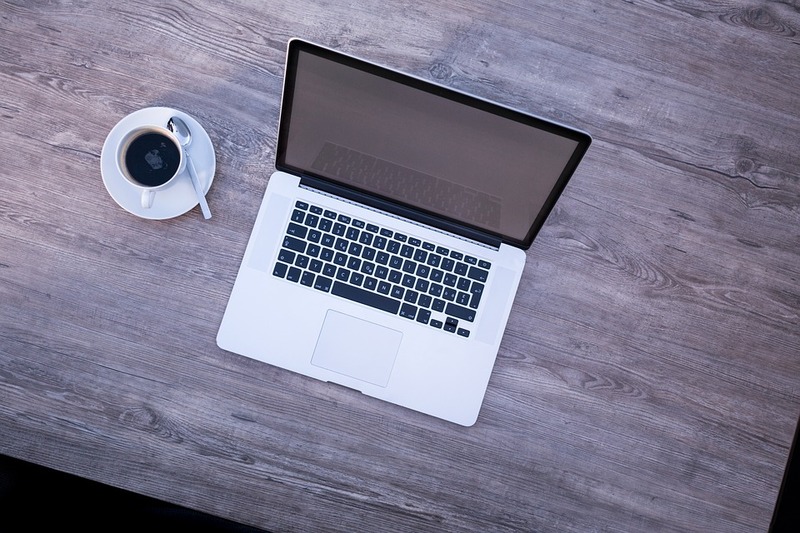 Fortunately, there are new techniques and tools to make the process more successful. You’re invited to a webinar to learn more. 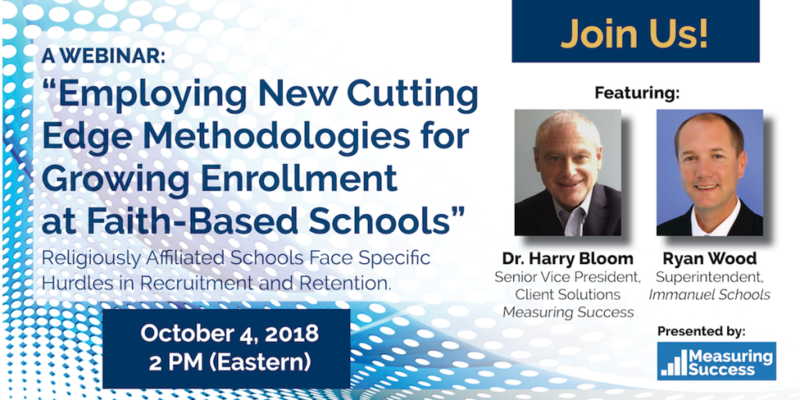 Join Dr. Harry Bloom of Measuring Success and Ryan Wood, Superintendent of Immanuel Schools (Reedley, CA) to learn about and discuss the new emerging enrollment management paradigms and explore their relevance for your school. you at one of our online events.